In addition to supplying Maryland businesses with all of their warehouse equipment essentials, S.W. Betz takes pride in getting involved in the community. So when a local Boy Scout approached S.W. Betz asking for insight into his Eagle Scout Service Project, our expert team was excited to help! Read on to find out more. 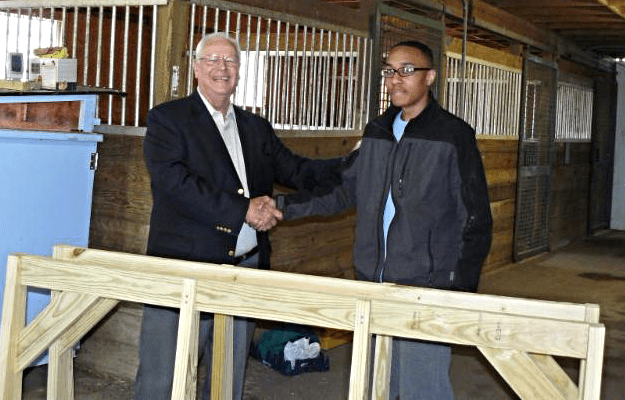 Grant’s Eagle Scout Service Project was in aid of the Maryland Agricultural Resource Council (MARC). MARC’s goal is to promote agricultural efforts throughout Maryland and to hold events for the purpose of educating the public on important agriculture issues. MARC requires storage for its various events in Maryland, and Grant’s project was designed with this in mind; he and his team built three wooden portable storage carts to hold the folding chairs and folding tables used by MARC for their events. MARC has hosted events for thousands of attendees, and Grant’s creation will help make the running of these events go much more smoothly. S.W. Betz was able to consult with Grant on the construction of his portable wooden carts. In order to make them effectively portable, the use of high-quality casters was required. Finding a customized solution is what S.W. Betz does best, and so our team worked with Grant to recommend the right type of casters for the carts based on their weight requirements and the type of environments they would be used in. Additionally, S.W. Betz donated some of the casters to Grant so that he could successfully complete his Eagle Scout Service Project. S.W. Betz was proud to take part in a project that promoted the efforts of the Boy Scouts of America. Eagle Scouts in years past have achieved great things, and we expect those great things to be a part of Grant’s future as well! This entry was posted on Thursday, May 28th, 2015 at 8:46 pm. Both comments and pings are currently closed.